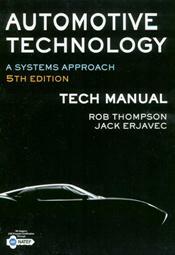 Jack Erjavec has become a fixture in the automotive textbook publishing world. He has many years of experience as a technician, educator, author, and editor and has authored or co-authored more than thirty automotive textbooks and training manuals. Mr. Erjavec holds a Masters of Arts degree in Vocational and Technical Education from Ohio State University. He spent twenty years at Columbus State Community College as an instructor and administrator and has also been a long-time affiliate of the North American Council of Automotive Teachers, including serving on the board of directors and as executive vice-president. Jack is also associated with ATMC, SAE, ASA, ATRA, AERA, and other automotive professional associations.